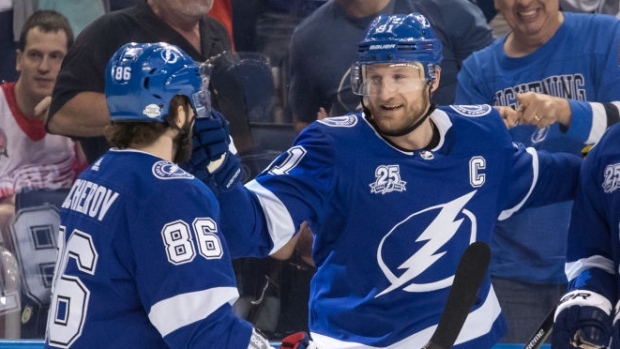 After the first five days of the new NHL season, Andrei Vasilevskiy and the Tampa Bay Lightning remain in familiar territory – atop TSN’s weekly Power Rankings. Tampa Bay is expected to be a force to be reckoned with again this season after Vasilevskiy made 42 saves in the Lightning’s 2018-19 season opening night shootout win over the Florida Panthers. They’re also the top-ranked team for the second consecutive week in our weekly Power Rankings, according to consensus rankings formulated by the TSN Power Ranking panel of Ray Ferraro, Jeff O’Neill, Jamie McLennan, Craig Button and Darren Dreger. The No. 2 Nashville Predators, who finished the 2017-18 regular season with the league’s best road record (25-9-7), move up two spots from No. 4 a week ago after two road victories in their first two games. Making a huge jump to No. 3 this week from their No. 14 ranking a week ago are the rejuvenated and unbeaten Dallas Stars under new head coach Jim Montgomery. Rounding out the top five this week, according to our panel, are the No. 4 Toronto Maple Leafs, who slip one spot after losing their second game of the season to the surprising Ottawa Senators on home ice, and the No. 5 Colorado Avalanche, who leap 13 spots from their No. 18 ranking last week with convincing wins in Week 1. The Winnipeg Jets, last week’s No. 2 team, fall four places to No. 6 this week after having an off night in their 5-1 loss to Dallas on Saturday after winning their opener against the St. Louis Blues, also a 5-1 score. Last season, the Jets started their season with less than stellar outings but soon found their winning form and finished second overall with 52 wins and 114 points. The other top-10 teams in this week's rankings include: the No. 7 Washington Capitals, falling two spots from No. 5 a week ago; the amazing Carolina Hurricanes at the No. 8 spot, leaping 19 places from No. 27 last week; the No. 9 Chicago Blackhawks, led by Jonathan Toews’ five goals to catapult from the No. 29 spot a week ago for the most significant move of the week; and the Anaheim Ducks, who climb to No. 10 from No. 16 a week ago. The Blues suffer the biggest drop of the week, plummeting 15 spots to No. 26 overall from No. 11 last week after managing just a single point in their first two games of the season. Besides Toronto, who are led by Auston Matthews’ eight points in three games to sit atop the NHL scoring race and four goals from John Tavares, and Winnipeg, the other top Canadian team this week is the No. 11 Montreal Canadiens, who move up 12 spots after opening the season at the No. 23 position. Hiding out in the NHL’s basement this week are the No. 27 Detroit Red Wings, Minnesota Wild at No. 28, Edmonton Oilers at No. 29 ­– falling 12 spots after losing their opener to the New Jersey Devils in Sweden, the winless New York Rangers at No. 30 and the No. 31 Arizona Coyotes, who fall from their No. 24 ranking a week ago. Last season’s best road team (25-9-7) with the NHL’s best overall record (117 points) took up right where they left off, winning their first two games, both on the road. The season couldn’t have started off better with 3-0 and 5-1 wins. Jamie Benn, Tyler Seguin and Alexander Radulov each have two goals in two games under new coach Jim Montgomery. Auston Matthews and free agent signee John Tavares are already in great form. Between the two of them they’ve scored nine of the 13 Toronto goals in their first three games. A great start to the season for the Avalanche with wins in their first two games. Colin Wilson scored two goals in the second game, one third of his total of six from all of last season. Two 5-1 road games marked the season opening for the Jets. In the opening win over St. Louis they allowed 42 shots, and in the loss to Dallas they allowed three power play goals. Forget about the Stanley Cup hangover. The Capitals won their opener 7-0 over Boston and scored 13 goals (T.J. Oshie has five points) in their first two games for new coach Todd Reirden. With Cam Ward gone and Scott Darling injured, the Canes used backup goalies in their first three games (2-1 OT loss, 8-5 win for ex-Flyer rental Petr Mrazek, a 3-1 win for ex-Leaf Curtis McElhinney). The Blackhawks went to OT in each of their first three games, defeating Ottawa and St. Louis on the road before losing to Toronto at home. Jonathan Toews has five goals and Patrick Kane has four. The Ducks have been outshot 74-35 in their first two games but still won both of them. Maxime Comtois is a surprise with two goals and John Gibson made 41 saves in a 1-0 shutout Saturday. The Canadiens opened the season on the road in impressive style, winning 5-1 in Pittsburgh and earning a point in an overtime loss in Toronto. Now they get to play five home games in a row. It took Travis Zajac 20 games to score his first two goals last season. This year he did it in his first game, helping the Devils to a 5-2 season opening win over Edmonton in Sweden. Two shutouts, one an embarrassing 7-0 loss and the other a 4-0 win over Buffalo, with ex-Islander Jaroslav Halak earning a shutout. Brad Marchard has assisted on every Bruins goal so far. Allowing 11 goals in their first two games is not the way the Penguins want to start the season, but curiously it’s better than last year when they allowed 15 goals in their first two games. A mediocre start for the Sharks, who will be tested with five of their first six games on the road. Newly acquired Erik Karlsson had an assist in an OT win over L.A., but Joe Thornton is back on IR (knee). The Flyers opened with consecutive road games, and will play five of their next seven at home. But former Leaf James van Riemsdyk is out five to six weeks with a lower-body injury suffered Saturday. Artemi Panarin scored the winner to give the Blue Jackets an opening OT win over Detroit. They’ll have to negotiate the early part of the season without stud D-man Seth Jones who's out at least a month. Oft-injured goalie Roberto Luongo lasted half of Florida’s opening game before being helped off the ice with what was diagnosed as an MCL strain. The 39-year-old is out for two to four weeks. Ilya Kovalchuk didn’t waste any time proving his value, earning two assists in the Kings’ second game playing on a line with Anze Kopitar while former undrafted free agent Alex Iafallo had two goals. It won’t be easy for the Islanders this season without John Tavares, but they still have Matt Barzal, who assisted on the opening game OT winner and had points in three of their first five goals. The Golden Knights, who started their inaugural season at 7-1, won’t be sneaking up on anybody this season. Marc-Andre Fleury was pulled in the opener but rebounded with a 2-1 shootout win. The Flames avenged a 5-2 loss at Vancouver with a 7-4 defeat of the Canucks at home – scoring one shorthanded goal, two at even strength, three on the power play and two empty-netters. Ranked dead last in our opening power rankings, the surprising Senators opened the season with points in their first two games – an overtime loss to Chicago and a win on the road in Toronto. The Sabres rebounded from an opening shutout loss to Boston to defeat the Rangers, in large part because of new goalie Carter Hutton who faced 20 third-period shots to earn the 3-1 win. In their opening split with Calgary, the Canucks’ newest star in Swedish rookie Elias Pettersson had points in five of the team’s nine goals and scored his first NHL goal on his first shot. Coach Mike Yeo said the Blues loss to Chicago (5-4 in overtime) was brutal. Anything but brutal was newcomer Ryan O’Reilly. The former Sabre assisted on four of the team's first five goals. Showing some hope for the future, 2016 first-round pick Dennis Cholowski scored his first NHL goal and Detroit’s first of the season in the opener. In the second game, the defenceman had two assists. Milan Lucic, who scored just one goal in his last 46 games last season, scored the first goal of the season for the Oilers in their opener in Sweden but they still lost (5-2) to New Jersey. The only good news from their 0-3 start is that Henrik Lundqvist has a .933 save percentage after his two starts. Scoring five goals against Carolina would have been good had they not allowed eight. It was the worst possible start for the Coyotes, being shut out in their first two games. It’s an early repeat of last season when they received good goaltending but couldn’t score.